As one of the biggest personalized e-commerce projects in Europe, we are dealing with huge amounts of data. Our goal is to offer tailored content and an unique online shopping experience to each individual who is using our products. Therefore, we need enthusiastic interns who love data and bring in first points of contact with PHP5 and its frameworks (Laravel, Symfony, CodeIgniter) to support us reaching this goal. As our PHP Development Intern (m/f) you will be taken by the hand and learn everything to succeed in the e-commerce field. We are an ambitious and fast growing e-commerce retailer from Hamburg, Germany. Since its launch in May 2014 we are working on our centerpiece ABOUT YOU, an online shop for fashion. Our objective is to have a lasting impact on the e-commerce market and to create an inspiring and personalized shopping experience for a young, digital target group. More than 2,5 million customers have already convinced themselves. In less than three years we are proud to register a rapid growth of brand awareness and to be part of the top 5 fashion players in Germany, Austria and Switzerland. Around 300 employees, including experts of fashion, marketing and business intelligence, as well as tech-talents with an average age of 29 years, work hard on entering the top 5 of Europe with ABOUT YOU. We have high demands on the quality of our work and ourselves. We count on openness, speed and passion and keep learning day by day. If you want to become part of our motivated team and work on one of the most thrilling e-commerce-projects, do not hesitate to get on board and convince yourself! If you want to learn more about us and our working habits, feel free to check Facebook and our Developer Blog. 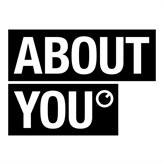 Want to get notified about new jobs at ABOUT YOU GmbH?